Compact, stylish and packed with personality, the Ford Ka is a fun city car that'll make short work of busy streets and is capable of slipping into the smallest of parking spaces. The interior is spacious enough for a car of this size and the drive is sharp and responsive. 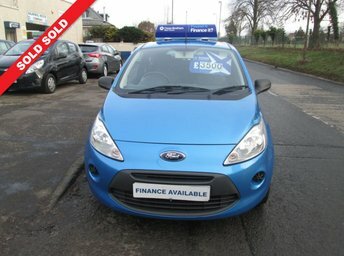 Come and discover the lineup of used Ford Ka models for sale in Dalkeith by paying a visit to Cochranes Motor Company today. You can browse our latest vehicles in person and a member of the showroom team will be on hand to offer advice and guidance when required. Finance is available to UK residents aged 18 years or older, subject to status. Terms & Conditions apply. Indemnities may be required. Other finance offers may be available but cannot be used in conjunction with this offer. We work with a number of carefully selected credit providers who may be able to offer you finance for your purchase, commission may be received. We are only able to offer finance products from these providers. Postal Address: Cochranes Motor Company, 56 Easthouses Road, Easthouses, Dalkeith, Midlothian EH22 4EL. Find contact details here.